An image of Pooh and Tigger has been censored on Weibo. Following the recent summit between President Xi Jinping and President Barack Obama, Weibo users pounced on a new favorite meme: a juxtaposed cartoon image of Winnie the Pooh with sidekick Tigger in tow, next to a photo of Xi and Obama walking in a similar position in relation to each other. 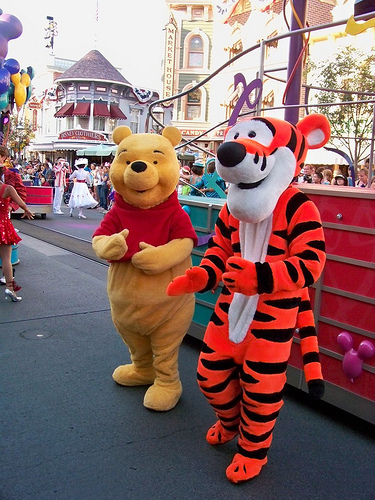 In the image, Xi (in the part of Pooh) and Obama (in the part of Tigger) are seen strolling on the grounds of Sunnylands estate (in place of A.A. Milne’s enchanted Hundred Acre Woods, inhabited by Pooh, Christopher Robin and friends). As expected, after the image was initially posted on Weibo by “Nicaragua Rabbit”, it then heavily made the rounds on the microblogging service – until censors stepped in to “harmonize” it. Apparently, censors did not find the Xi-Pooh comparison endearing. While it would seem that censors are a tad jumpy, perhaps lacking a modicum of humor, The Telegraph cites an interesting report that suggests otherwise. According to the study, conducted by Harvard University, “negative, even vitriolic, criticism of the state, its leaders, and its policies are not more likely to be censored” than other types of Weibo posts. The Harvard researchers determined that the crux of censors’ efforts to control Weibo sentiment boils down to preventing “collective action by silencing comments that represent, reinforce, or spur social mobilization”. Indeed, this was not the first time Chinese censors have curtailed Weibo users who have poked fun at or criticized the government. Earlier this month, leading up to the anniversary of Tiananmen Square, a number of memes popped up on Weibo, from photoshopped yellow rubber ducks in place of tanks (a play on the “Tank Man” photo) and a Lego reenactment of the same scene to more indirect references such as the image of a praying mantis flailing its arms at a car tire that appears ready to crush it.